Softcover, 8 1/4 in. x 11 1/2 in. 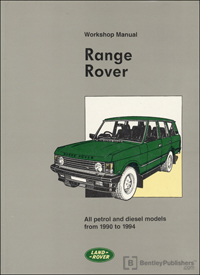 The Range Rover Official Workshop Manual: 1990 - 1994 is an invaluable guide to the efficient repair and maintenance of your 1990 - 1994 Range Rover. Highly detailed illustrations and instructions on everything from engine maintenance to chassis and body repair make this manual a must-have for the Range Rover owner and driver.